Vikings – Wolves of Midgard is at it’s best when it engages you in mindless bloody carnage.That’s not to say the game is easy or simple. When I hit “start” on this third-person action rpg from developer Games Farm, I was expecting a Diablo-adjace experience full of hacking and slashing, maybe a spattering of samey classes and perhaps a serviceable upgradeable skill tree. 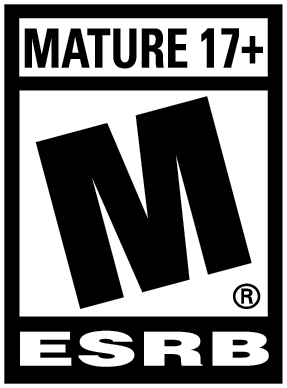 It’s been a long time since a game of this genre has impressed me, so maybe my expectations were a bit skewed. It didn’t take long for Vikings to bludgeon those expectations into a meaty, undulating pulp. Vikings differentiates itself from its genre forefathers, paying homage to its roots while managing to step it up in ways that similar games like Brut@l, which I reviewed last month, never manage to accomplish. Much of this revolves around the game’s use of Norse mythology, which informs everything from the story to the character classes to the often extremely vicious moment-to-moment gameplay. 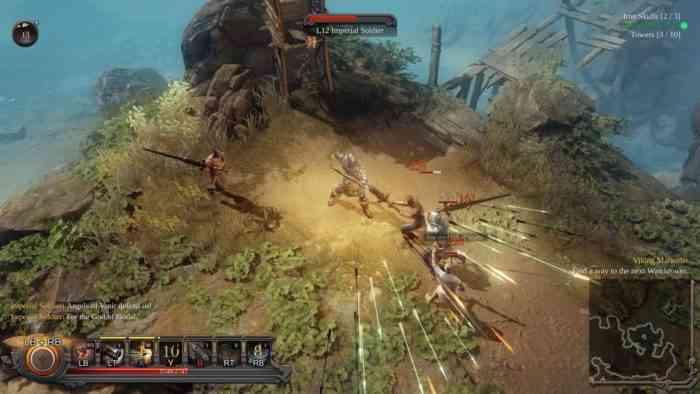 Each of the game’s five classes, for example, are tied to a Norse god and their respective weapon of choice – the Loki classes use spells and a staff weapon, Thor’s focus on big hammers and brute-force abilities, Skathi’s use ranged weapons and abilities to attack from afar, and so on. While each class can use any weapon they pick up on the battlefield, each of which can force you to drastically change your attack patterns , perks and powers are given if you use diety-specific weapons types. Giving each class benefits based on weapon proficiency allows them to feel equally accessible and fun while giving them a sense of individuality. There’s also a narrative logic to those proficiencies because of the game’s Norse trappings, showing that Games Farm put a lot of thought into not only how it all works, but why it should work that way. Those narrative elements also affect how you approach the game’s varied environments. While they are visually rather forgettable – something I’ve always felt about games of this type, as the camera positioning and distance doesn’t allow for much graphical detail – they each come with their own ecological hazards. If you’re on a snow-swept mountain battling ice giants, you’ll need campfires and thickened gear to keep you from freezing to death. Similarly, if you’re in an arid, sun drenched land, you’ll need to find shade and cave dwellings to fend off the scorching heat. These environmental factors may feel like a nuisance at first, but they are actually one of the best tools that Vikings employs to break up the monotony of its gameplay. In fact, you’ll often find yourself debating whether to go after the next enemy camps or to find a safe place to rest and warm up. Unfortunately those trappings don’t do much for the game’s actual narrative. In this area, Vikings doesn’t feel all that different from its progenitors, in that its story vacillates between incomprehensible to inconsequential. You play as a chieftain of the Ulfung clan – the titular Wolves of Midgard – whose village is destroyed by the Fimbulvetr, creatures of ice and fire who are hell bent on destroying all of Asgard. As chieftain, you’re tasked with rebuilding your village in the ways that only a Viking knows how, From pillaging and annexing nearby clans, gathering resources for your villagers, and defending your walls from encroaching ice giants, none of these tasks are tied together by an overarching story, instead feeling like disconnected periods in your chieftain’s day-to-day. Which is why, as I said, Vikings is at its best when you’re making a bloody, pulpy mess of things. The moment-to-moment gameplay is vicious and bloody, and the game’s sound design gives every successful swing of your hammer or staff a cathartic sense of impact. Games Farm didn’t skimp on the gore, which makes sense given the brutal nature of Viking lore, but even that bloodiness informs the game’s mechanics, specifically character progression. Instead of XP, you accumulate the blood of your murdered foes, sacrificing it to your deity of choice in exchange for upgrades to your character and weapons. To further that, the gods offer you repeatable trials, which usually require you to mow down waves of enemies, offering you more blood and loot as reward for completion. 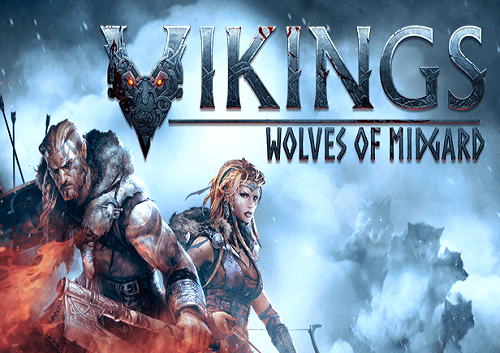 Vikings – Wolves of Midgard has a lot going for it. The gameplay is fun, frantic, and satisfyingly brutal. The underlying systems are all well thought-out, providing opportunities for unique experiences based on the classes you play, and the environmental dangers require you to think about your tactics more often than most games of this genre allow. If you can ignore the game’s middling narrative motivations, you are in for a very bloody good time.